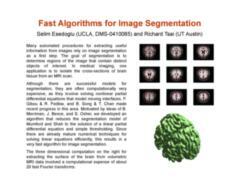 In joint work with Richard Tsai, we describe efficient algorithms, based on the threshold dynamics idea of Merriman, Bence, and Osher, for minimizing the piecewise constant Mumford-Shah functional of image segmentation. Esedoglu, S.; Tsai, Y.-H. Threshold dynamics for the piecewise constant Mumford-Shah functional. Journal of Computational Physics. 211:1 (2006), pp. 367-384.